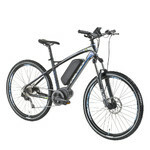 E-bike suitable for challenging terrain, BROSE centre drive, Rock Shox suspension fork, wide Schwalbe tires, hydraulic disc brakes. Drill resistant bike lock, nylon cover, steel cable, high quality. 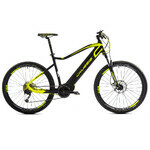 Mountain E-Bike 4EVER Ennyx 2 27.5” – 2018 is perfect for fans of long trail rides, downhill rides and challenging uphill rides. This multi-purpose bike can be used all-year-round in any weather. The 250W high torque BROSE center drive allows for the top speed of 25 km/h. Built into the frame, the high-capacity battery allows for the distance range of 120 km, thus taking you wherever you wish to go. The drive is activated when you start pedalling (there is a pedalling sensor). The smooth and quiet running is a must. The cycling computer displays all the important information, such as current/max/average speed and overall/daily distance. 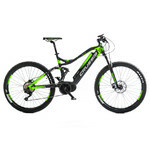 Mountain E-Bike 4EVER Ennyx 2 27.5” – 2018 also has a modern frame design, balanced center of gravity and top components made by world’s most famous manufacturers to provide quality and durability. You may also appreciate the top class Rock Shox suspension fork and 10-speed Shimano gear shifter. The extra wide 27.5+” Schwalbe tires will deal with any terrain, always sticking to the surface. If you are a cycling freak, then Mountain E-Bike 4EVER Ennyx 2 27.5” – 2018 is just the bike for you. Note: Store the battery in a dark and dry place in temperatures between 10°C and 20°C. If you intend to store the product for a longer period of time, charge it to full capacity and then recharge it every six months. Warning: Store the battery in a dry place and away from light, with room temperature between 10°C and 20°C. Before storing it for a longer period of time, charge the battery to full capacity. Repeat the process every month. Don't know what bike type and size to choose? Find out more in our guide. Don't know how to choose an e-bike? Find out more in another of our guides. Want to test out your e-bike before buying it? If you live in the Czech Republic or Slovakia, it's not a problem. Just visit one of our stores. Note: The expected max. travel distance depends on various factors, such as the amount of electric assistance, user weight, terrain, wind and the inflation pressure, pattern and temperature of the tires. All stated travel distances are valid under optimal conditions, meaning even terrain with no wind, temperature of 20°C, extremely narrow tires with no profile and user weight under 70 kg. Wheel size is given in inches. Generally speaking, the more the better. Mountain and cross bikes should have at least 24 speeds (road bikes should have at least 18). The main part of a bike. Other parts and components are affixed to it. It has a shape of an uneven pentagon, but the main load-bearing part is made up of an uneven quadrangle with an adhering triangle at the rear (unless the bike has rear fork suspension). Brakes are an essential part of a bike. The two most common types are disc brakes and V-brakes. Disc brakes are more effective, but need to be maintained more often, while V-brakes are easy to maintain and last longer. Other braking systems include drum brakes or a coaster brake (in children's bikes). Serves to attach the front wheel and brake. Brakes are an essential part of a bike. The two most common types are disc brakes and V-brakes. Disc brakes are more effective, but harder to maintain. On the other hand, V-brakes' maintenance is easier and they will last longer. ther braking systes include drum brakes or a coaster brake (children's bikes). Brakes are an essential part of every bike. The two most common types are disc brakes and V-brakes. Disc brakes are more effective, but harder to maintain. V-brakes are on the other hand easier to maintain and last longer. Other braking systems include drum brakes or a coaster brake (on children's bikes). Hubs are placed in the centre of the wheels. A hub is made up of bearings, cups and nuts and is attached to the bottom bracket that connects the wheel with the fork. Hubs make up the centre of the wheels. A hub is made up of bearings, cups and nuts affixed to the bottom bracket whichs serves to attach a wheel to the fork. Tires serve to protect the tube inside and they optimize the riding attributes of your bike, both on the road and in terrain. Mountain bike tires are wide and have a complex pattern that allows for movement on difficult terrain. Road bike tires, on the other hand, have a shallow pattern and are thin and smooth. Tires serve as a protection of the inner tube and optimalize the riding qualities of a bike in terrain and on the road. Mountain bike tires are wide and have complex patterns, allowing for riding through hard terrain. Road bikes on the other hand have thin and smooth tires with only a shallow pattern. Levers or grip shifters change the revolving ratio in the relation of the front sprocket wheel (crankset) and the rear sprocket wheel (cassette) with the help of the front and rear derailleur. Gear shifting on the rear wheel. Plates and one to three sprocket wheels transfering the pedal movement onto the chain. On modern bikes, sprocket wheels on the rear wheel are affixed to a cassette. Along with the front derailleur, they add more gears and the rider can choose the optimal speed/pedalling ratio. Cassettes can be taken apart and the sprocket wheels exchanged for others (new or with different number of sprockets). The chain transfers the pedalling force into the rear wheel. it connects the cassette on the bottom bracket and the cassette on the rear wheel. It needs to be lubricated often. A metal circle with a U-shaped profile. It creates space for the inner tube and tire. Bikes designed for professional use and therefore more demanding riding style have double-walled rims. Such rims provide higher durability and better safety. Rims for regular bikes are usually made of dural, rims for special bikes can be made of special alloys or composites. They transfer the power generatted by your legs into the pedalling mechanism. Handlebars are connected to the stem and they help steer the bike. They carry braking elvers, gear shifters, grips and accessories, such as a cycling computer, a bell, a map and many others. They come in different shapes, i.e. riser bars, bullhorns or drop bars. 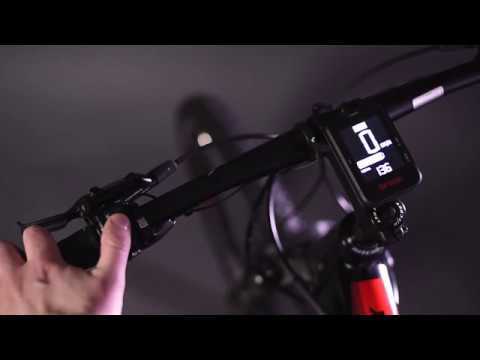 Connects the front fork with the handlebars. Some types are adjustable. The sitting part of a bike. It is attached to the seat post which allows you to adjust the saddle's height. Tube that connects the frame with the saddle. It's length is adjustable to accomodate users of different heights. These days, it is affixed to the frame with a quick-release mechanism. In the past, a nut and a screw were used. The total weight of the product. Try out a bike or an e-bike! 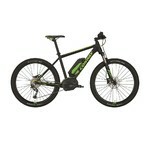 How to Choose an Electric Bike?